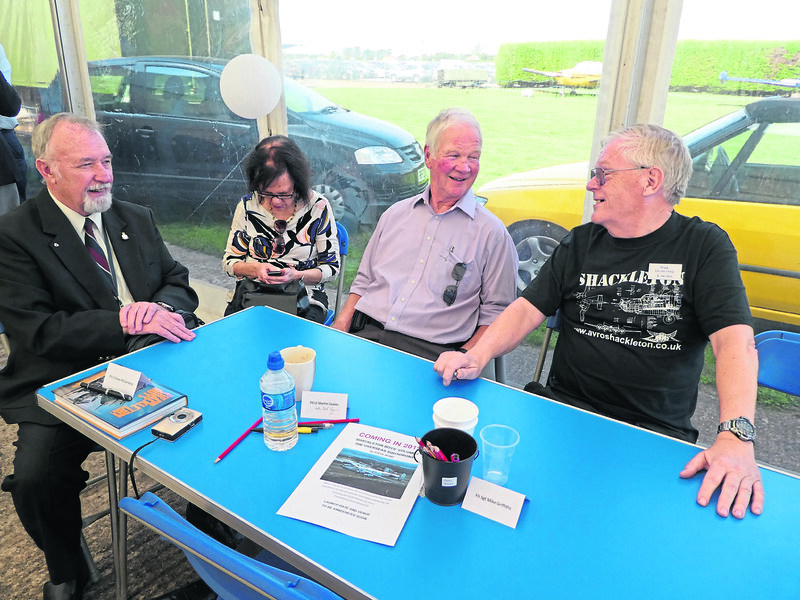 Sheila’s husband, Mike, was a flight engineer on Shackletons, based at RAF Lossiemouth during the 1970s, and like many of his colleagues he suffered from hearing loss. In fact, the first thing you notice when you encounter a group of former Shackleton aircrew is that most of them are wearing hearing aids. There’s a good reason for that. The aircraft was powered by four massive Rolls-Royce engines, and sitting inside a narrow metal fuselage with little sound-proofing for 16 or 17 hours at a time resulted in many air crew suffering from high-tone deafness. But despite the noise, the vibration and the discomfort, crews look back fondly on their time flying The Shack. The Shackleton was designed by Roy Chadwick, of aircraft manufacturer Avro. He had been responsible for the mighty Lancaster bomber, but the Shackleton was designed to have a longer range and more space inside for electronic gadgetry. Its primary role was as a maritime reconnaissance aircraft, particularly looking for submarines during the Cold War. It was operated by RAF Coastal Command, known in the service as the “Kipper Fleet”. 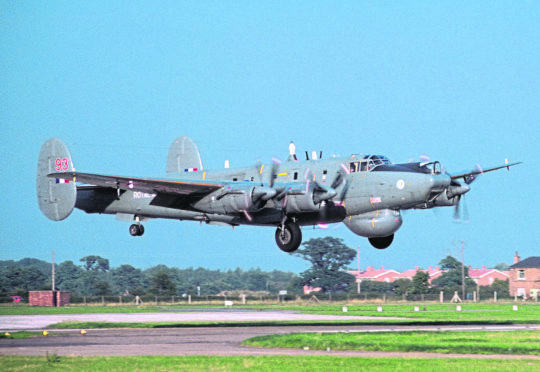 The first Shackletons went into service with 120 Squadron at RAF Kinloss in 1951. On one occasion, a Shackleton was flying so low over the Atlantic that the radar pod projecting underneath the fuselage was ripped off by a particularly large wave. The crew only discovered what had happened when one of them went back down the fuselage to find out why the radar wasn’t working, and discovered a big hole in the floor where it should have been. Crew at their stations with very little room for manoeuvre. Shackletons were also used for search and rescue, and many a stranded trawlerman and lone yachtsman has been grateful to hear the distinct growl of the four Griffon engines as the plane dropped supplies and directed other vessels to provide assistance, if needed. It was the job of the ground crew to service and maintain the planes and the equipment on board. But invariably the work had to be carried out in the fresh air. The planes would only be taken into a hanger for the most complicated jobs. Imagine standing on top of a ladder trying to thread a tiny bolt as an icy north wind blows in off the Moray Forth. The winter of 1962/63 was one of the worst, and was nearly disastrous for Sergeant Alec Audley, an air wireless fitter with the Air Radio Servicing Flight at Kinloss. He’d been recruited to clear snow from the main runway and was standing in the back of a small lorry shovelling out salt and sand, when he looked up through the gloom to see a Shackleton on final approach and heading straight for him. The driver jammed his foot to the floor and they just got out of the way in time. Despite their size, there wasn’t much spare room inside the Shackleton for the regular crew of 10. There was a pilot, a co-pilot and a flight engineer, who were responsible for keeping the plane in the air, but the other crew members operated the various navigation, radar and weapons systems. They each relied on the other, although there was always plenty of banter between them. 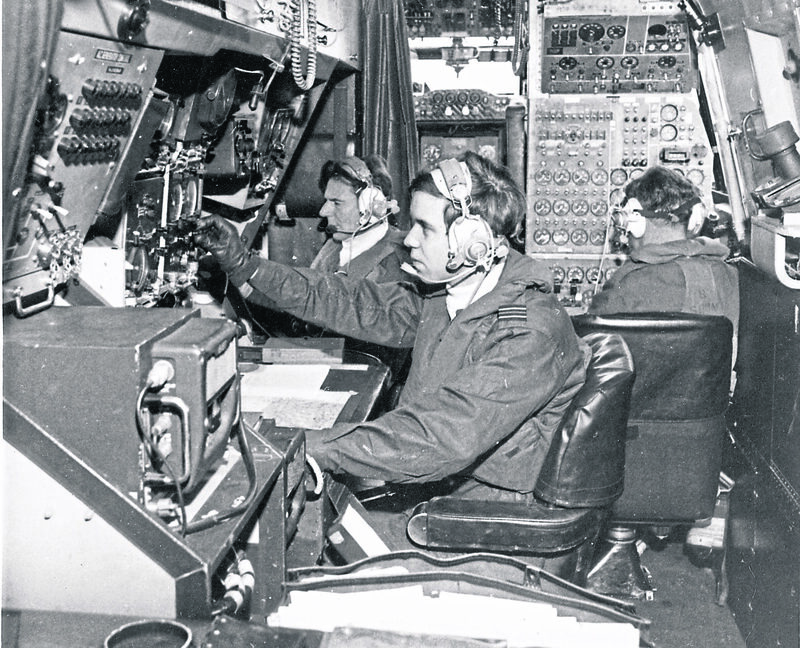 Pilots referred to the crew as “talking freight”, while the radar and electronic experts dismissed the pilots as “the drivers”. Conditions on board were spartan, but they did have some home comforts. The seats were leather and even incorporated an ashtray in the armrests. Sometimes they were too comfortable. Guy Gibbons remembers one overnight flight from the UK to Gibraltar. “We were delayed leaving by several hours, so we were even more exhausted than usual,” he says. There was a small galley for heating food and brewing coffee, although preparing a meal as their plane lurched through bad weather must have been a real skill. And, yes, there was a loo on board. The Elsan was to the rear of the fuselage, but you didn’t want to be near it when the plane hit an air pocket. And neither did you want to be the member of the ground crew tasked with emptying it when a Shack returned from a long flight. As more and more equipment was loaded on to the Shackleton, and extra fuel had to be carried to extend their range, they became seriously overweight. The joke among pilots was that they only made it into the air because of the curvature of the Earth. Later models were fitted with two jet engines to assist take off, although they were only allowed to run for a few minutes. By 1971, the planes at Kinloss were 20 years old and were being replaced by jet-powered Nimrods. But Shackleton Boys author Steve Bond, himself a former RAF man, says the old “Growlers” found themselves with a new role. So in early 1972, 8 Squadron was reformed at Kinloss, moving a few miles along the coast to Lossiemouth later that year. The Growlers started patrolling the northern seas on the lookout for Soviet aircraft heading for UK airspace. “Mind you, we had some fun with the Navy lads who flew with us to operate the AEW system,” says Flight Sergeant Mike Griffiths, who was a flight engineer with 8 Squadron. Mike also points out that as the squadron was responsible for finding Soviet aircraft, and directing RAF fighters on to the target, they became part of Fighter Command. “I reckon we were the only four-piston-engined fighters in the world,” he says proudly. 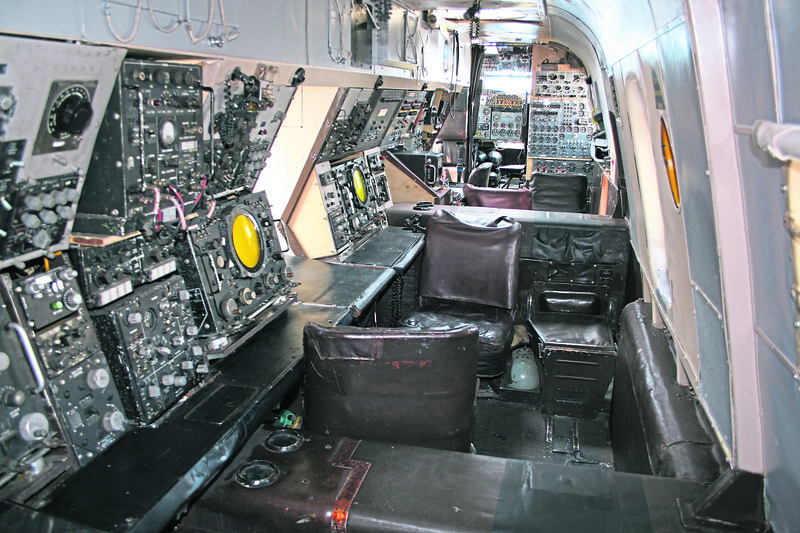 The decision to install the AEW in the Shackleton was only meant as an interim measure, until the Nimrod was equipped with a brand-new radar system, but the project was years overdue and eventually cancelled in 1986. So the Shacks had to carry on, despite being well over 30 years old. 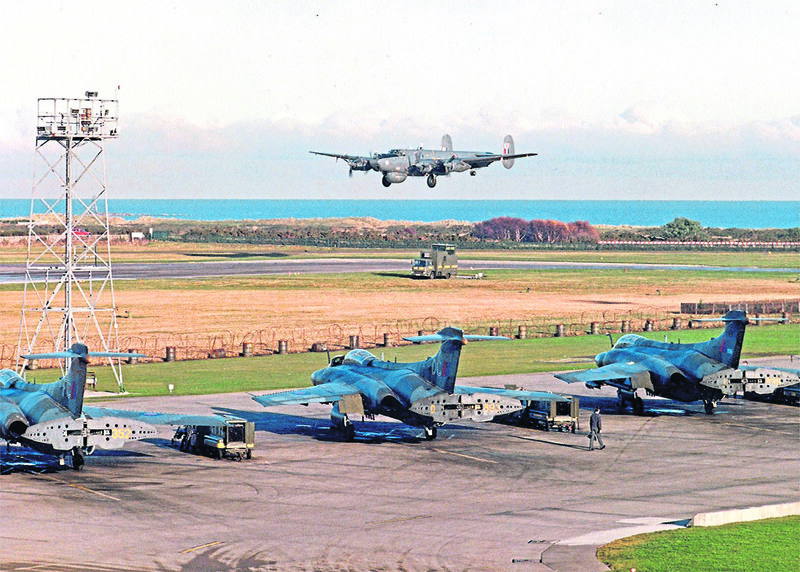 An AEW Shackleton growls into Lossiemouth with three RAF Buccaneers in the foreground. Eventually the RAF took delivery of the Boeing E-3 Sentry, which basically looks like a jet airliner with a huge mushroom on its back, and in 1991 the “Old Grey Ladies”, as the Shackletons were affectionately known, left Lossiemouth for the last time. They’d served the country well for 40 years and were liked by the men who flew them, despite their idiosyncrasies. Shackleton Boys, by Steve Bond, is published by Grub Street at £25.